Apple Pay mobile payment system: More likely to succeed because of Apple's strong ecosystem. Different transaction stages using Apple Pay in apps. If you buy the new iPhone 6 or 6 Plus, you’ll be getting a big, pixel-dense screen and a snappy processor. But you’ll also be getting the first taste of Apple’s mobile payment solution which has the potential to grow into a whole transactions empire for the company. Apple Pay is meant to replace the current credit card payment system. As Apple CEO Tim Cook pointed out Tuesday, the magnetic strip interface on almost all U.S. credit and debit cards was created about 50 years ago. Though it’s impressive that the technology has endured this long, it’s ready for retirement, especially since credit card data hacks of retailers have been on the rise. Apple Pay stores all of your credit cards, or as many as you want to input, in the Passbook app, which debuted in 2012 as Apple’s mobile wallet. It uses near-field communication (NFC) to securely transfer data between customers and merchants and is protected by Touch ID, Apple’s fingerprint scanner. NFC has been a rumored addition to the iPhone since 2010, but Apple didn’t add it right away and even criticized the technology. Now, looking back, it seems like the company was trying to perfect the elements that would go into a mobile payment platform and test them individually with customers before adding NFC to actually allow a complete, one-step transaction. Millions of credit cards are already stored with Apple in iTunes, and that will help create a base for Apple Pay. When you first set up Apple Pay, your Apple ID will allow the company to offer the card you have on file for iTunes as a card that can immediately be ready to go in Apple Pay. And if you’ve set up Touch ID so your fingerprint unlocks your phone, Apple Pay won’t need any additional setup for authenticating transactions, either. Within minutes of enabling Apple Pay, you’ll be able to hold your phone near an NFC reader at a store and make a purchase. Apple Pay will be supported by most major banks and credit cards, with more being added, and will be accepted at any store that is already set up to accept NFC payments. 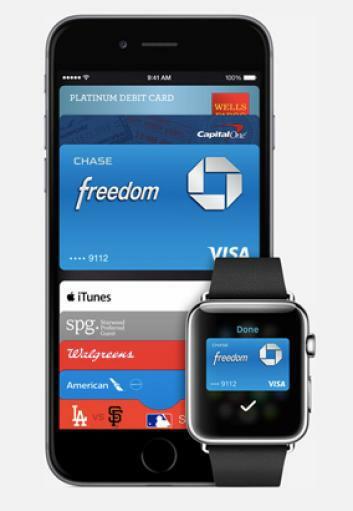 Plus, Apple Pay will be accepted at every branch of Subway, McDonald’s, Walgreens, Macy’s, Disney, and other chains. Plus Target is a partner too, as it tries to rehab its security image post-hack. 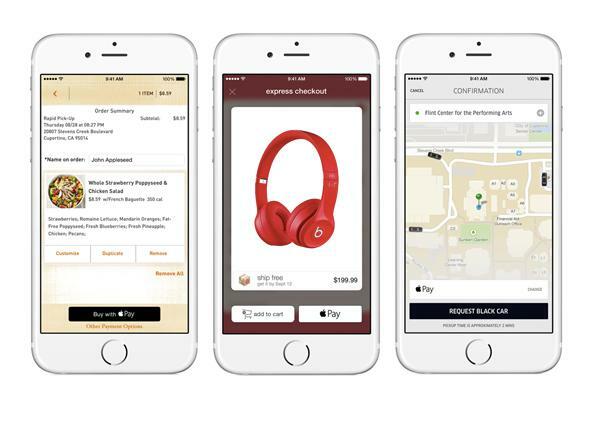 Apple Pay will also allow for one-tap payments in apps like Groupon and Uber. Apple Watch and iPhone 6 both have NFC for Pay. We don’t store the credit card number, and we don’t give it to the merchant. … [E]ach time you pay, we use a one-time payment number along with a dynamic security code. … Security is at the core of Pay, but so is privacy. We’re not in the business of collecting your data. Cue was clear that Apple won’t be able to see what you buy or where you purchased it. Though users may have reservations about security and privacy, it seems like this is the moment when mobile payments will finally catch on. Faith in the security of the current payment system has been eroded, plus the idea of mobile payment isn’t that new anymore. And many services similar to Apple Pay already exist. The difference is that Apple Pay taps into Apple’s extensive existing ecosystem and feels like an extension of the Apple services people already use rather than something new to learn. Up until now mobile payment hasn’t had widespread appeal. Apple Pay can change that. Disclosure: I did freelance copywriting for the mobile payment company Softcard, then called Isis, for about five months in 2013. I have no confidential or inside knowledge of the company’s current or past product and no stake in the company.